Home > News > What is a kayak ? 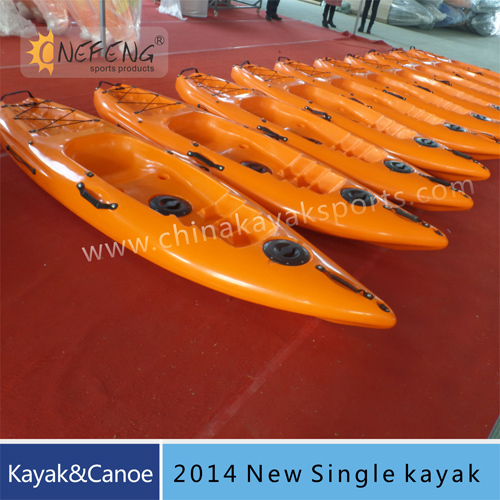 A kayak is a small, narrow boat primarily designed to be manually propelled by means of a double-bladed paddle. The word kayak originates from the Greenlandic Inuktitut language, where it is the word 'qajaq'. In the UK the term canoe is often used when referring to a kayak. The traditional kayak has a covered deck and one or more cockpits, each seating one paddler. The cockpit is sometimes covered by a spray deck that prevents the entry of water from waves or spray and makes it possible for suitably skilled kayakers to roll the kayak: that is, to capsize and right it without it filling with water or ejecting the paddler. Some modern boats vary considerably from a traditional design but still claim the title "kayak", for instance in eliminating the cockpit by seating the paddler on top of the boat ("sit-on-top" kayaks); having inflated air chambers surrounding the boat; replacing the single hull by twin hulls ("W" kayak), and replacing paddles with Other human-powered propulsion methods, such as foot-powered rotational propellers and "flippers". Kayaks are also being sailed, as well as propelled by means of small electric motors, and even by outboard gas engines, when possible. Photo of person sitting in boat holding paddle with otters swimming in foreground. Boat is approximately 12 feet long and only slightly wider than paddler. The kayak was first used by the indigenous Aleut, Inuit, Yupik and possibly Ainu hunters in subarctic regions of the world.